I use the phrase appropriately here, in my opinion, because in addressing those assembled at the National Prayer Breakfast, a crowd which included the President and Mrs. Obama and Vice President Biden, Dr. Benjamin Carson spoke his mind and his heart directly, even eloquently at times, and without malice or contentiousness. 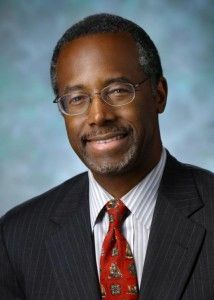 At the same time, Dr. Carson staked out positions on a few political issues of the day with which he clearly knew the president would disagree. But by calling what Dr. Carson did "speaking truth to power," I do not consider the "power" to have been President Obama. The "power" I think Dr. Carson spoke in spite of was the censorship of authoritative and opinionated speech effected by and through political correctness. He actually confronted that issue first, before he moved on to discuss the debt and the deficit and suggest the tax and health care reforms that garnered him so much media attention. The entire speech is well worth the 27 minutes of your time it will require to listen to it. You have yourself to blame . . .
And then the bad luck came. Why do we fault others? We have ourselves to blame . . . Things wouldn't have gone that way." You'll find the fault's in you . . .
You have Yourself to blame." 1. ↑ The poem, written by Mayme White Miller, is reprinted in one of Dr. Carson's books along with the following narrative, apparently written by Carson's mother, putting the poem in context. Along the way, Mrs. Carson gives a wonderful lesson in common sense parenting. "I don't remember whipping either boy more than once or twice. Because I vividly remembered my own childhood with its regular beatings, I did not want Curtis and Ben to have that kind of memory. If I talk to them enough, I decided, I could help them to do whatever was right and not have to punish them. "A few days after I said those words to Curtis, a man came by the house, selling books. One of them had a poem in it that I liked. I bought the book and memorized the poem, "Yourself to Blame." I quoted it often to the boys because it says what I really believe."